Hi everyone! Welcome to Mrs. Lincoln's Inkin' and today's card share! Today's card is amazingly amazing, at least that is what I am calling it:) I used the greeting from the stamp set Amazing Birthday and then backed it with a couple of banners using the Banner Framelits. You can get the stamp set and the banners in a bundle and save 15% (just an FYI, lol) To add a bit of "bling" I tore apart some of the Gold Sequence and glued it around the base of the card. 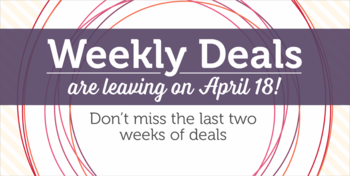 Yes, you read that right, Weekly Deals are going to be leaving. They were originated to help SU! with some of their overstocked items, as time has gone on this is really no longer needed... from now on (or beginning April 18th) there is going to be "Special Offers". This is going to happen every so often when SU! has an overstocked item that they are looking to share with you at a discounted price. 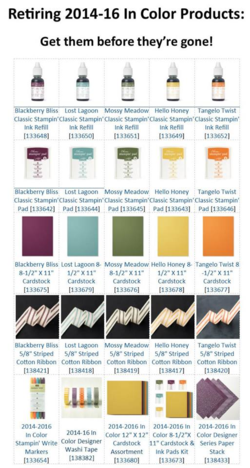 This includes the colors Blackberry Bliss, Lost Lagoon (so sorry to see this one go), Hello Honey, Mossy Meadow and Tangelo Twist. Make sure to get your items today while supplies last.